My name is Alyssa and I am the Everyday Maven. My blog is about cooking delicious, interesting, clean food while losing weight and staying slim - essentially, Whole Foods meets Weight Watchers. I started Everyday Maven after joining Weight Watchers as a way to share my recipes, food tips and tricks with other like-minded food lovers who are not willing to sacrifice taste and food quality for weight loss. When Snack Girl asked me to share a healthy and quick weeknight dinner recipe, I immediately knew I wanted to do a healthy Indian dish. See, as a longtime Snack Girl reader I know that Snack Girl (and you) love Indian Food but hate the added fat that is often present. Remember this post from last May? (see: Who Else Wants Restaurant Quality Indian Food Without The Calories? I do! I was so inspired I immediately ordered the Indian Slow Cooker and have made and loved a bunch of recipes from it (my favorite is the Simple Lentils). Since getting a healthy, delicious dinner on the table is really tough some nights (read: most! ), I wanted to provide you with a foolproof, easy and delicious dish that the whole family will love. Weeknights are tough; everyone is hungry, tired from work and nobody (especially my toddler) seems to have the patience for prep work and cook time. If this sounds familiar, then you will love this Slow Cooker Curry Chicken. I highlighted some additional ways to save even more time below. I hope you love it as much as we do and stop by Everyday Maven for more healthy, Weight Watchers friendly recipes! What a wonderful recipe and so full of flavor. I am bookmarking this one!! Thanks and have a great day! This looks great! Now to buy a slow cooker..... hah! Love the blog, Snack Girl! Thanks - will definitely give it a try! Do you have a suggestion for a book that features healthy Middle Eastern cuisine? Thank you very much for this! I think you read my survey -- it is one of the things I requested. We have a good Indian restaurant in the town where I live that offers a daily lunchtime buffet. 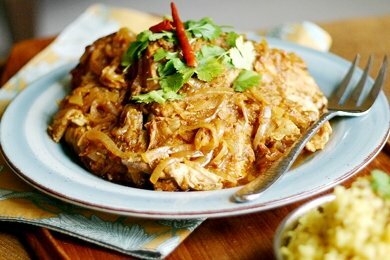 I've tried many new dishes and find myself craving curry, just looking for lighter ways to make it. Thanks for this recipe. I love most ethnic foods and I love healthy, crock pot recipes even more. Will try this soon, it looks delicious. Great guest post! Indian food is definitely a favorite around here...we can't get enough! This recipe looks delicious and I love how it's made in a slow-cooker...perfect for those busy days! Just out of curiousity - Why the vinegar? I use the Patak's (hot) to make curry dishes and I've never done that before. Is there any way to substitute curry powder for the paste? Could I just add a liquid (water? Coconut milk?) to the powder to make a paste consistency before adding it to the other sauce ingredients? All time favorite, Indian food!!! The flavor of this simmering dish must be awesome! Thank you for sharing this!! I looked up Patak's sauces -- there are a bunch to choose from. Safe to say we can use any of their sauces in this recipe?